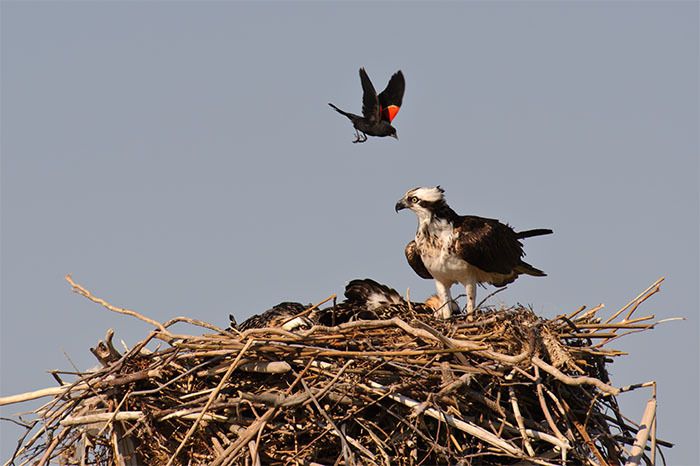 Red Winged Blackbirds aggressively defend their territory, especially during breeding season, even attacking an Osprey that is sitting on a nest of chicks. Photo © copyright by Vincent Mistretta. Each gallery print is personally printed by me in my digital darkroom using Epson Ultrachrome K3 Inks and Epson fine art paper. I have found that this combination offers the best museum quality prints available today. Please note that all quoted sizes are that of the paper. The actual printed image will be smaller. After printing, I allow your photograph to dry for several days. At that point I apply a coating to protect the print from fading. Please realize this process takes several days. Please refer to my prints page for more details.